MCLEAN, VA--(Marketwired - Jan 4, 2018) - Freddie Mac (OTCQB: FMCC) today released the results of its Primary Mortgage Market Survey® (PMMS®), showing average mortgage rates dropping to start the year. 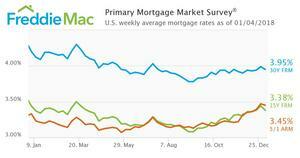 "Treasury yields fell from a week ago, helping to drive mortgage rates down to start the year. The 30-year fixed-rate mortgage fell 4 basis points from a week ago to 3.95 percent in the year's first survey. Despite increases in short-term interest rates, long-term interest rates remain subdued. The 30-year mortgage rate is down a quarter of a percentage point from where it was a year ago and the spread between the 30-year fixed and 5/1 adjustable rate mortgage is the lowest since 2009. With the FOMC minutes showing continued support for gradual increases in policy rates from many participants and inflation rates remaining low, there isn't much upward pressure on long-term rates at the moment. Whether that changes due to a tighter labor market and the economic impact of tax reform remains to be seen."